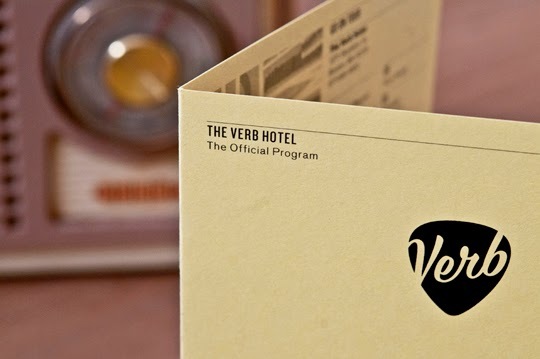 We're really excited to be able to unveil our work for The Verb Hotel that opened last week in Boston. 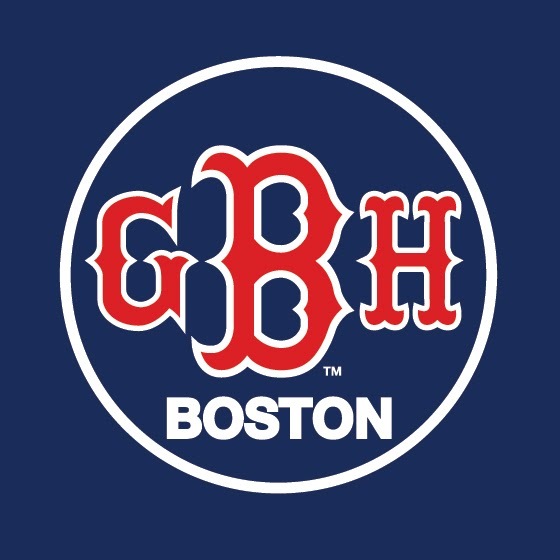 GBH have been working with Boston property developers Samuels and Associates since November, helping create this new hip hotel brand in Boston’s historically cultural Fenway neighbourhood. 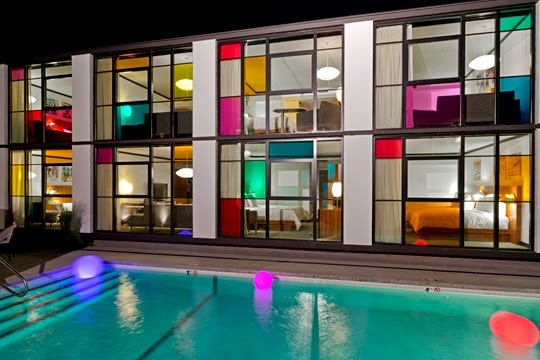 The project is a redevelopment of a 94 room, mid-century modern Howard Johnson motel, built in 1959 and, despite being a local icon, has since fallen into disrepair. 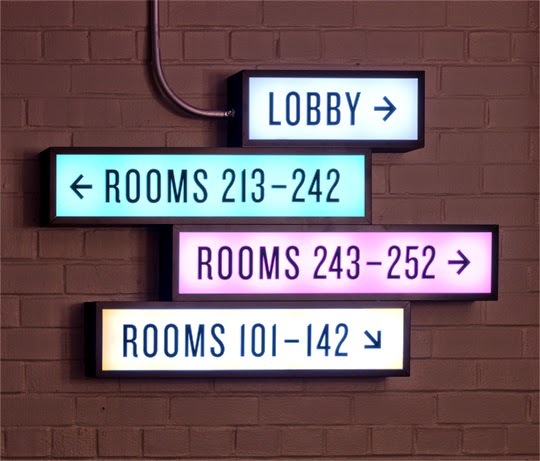 In addition to positioning and naming of the new hotel, GBH have created the identity, been closely involved in the interiors and all hotel touch points. To get under the skin of the brief, we decided to set up a 6 week pop up studio in the Fenway neighbourhood, which allowed us to fully research the history of the area and get involved with the plans for interior and exterior details right from the get go. Because of the close proximity of the famous Fenway Park baseball ground, home of the Boston Redsox (it's next door!) many brands in the area focus on baseball. However the neighbourhood has also nurtured a vibrant music and counter culture scene since the 1960s, with nearby Kenmore Square and a multitude of iconic music clubs on Lansdowne Street being the focus. A spirit of free-thinking bohemianism was championed through a local alternative weekly newspaper, the Boston Phoenix, which was also home to the offices of iconic radio stations WFNX-FM and WBCN-FM. Since the 60s, many Iconic bands have played the area - The Velvet Underground, Ray Charles, The Rolling Stones, Aerosmith, The Who, Springsteen, Nirvana - and we leaned that over the decades the hotel played host to many iconic, rock n roll moment, always being at the heart of the scene, like a cool local personality who’s seen it all and has the characteristic looks to prove it! 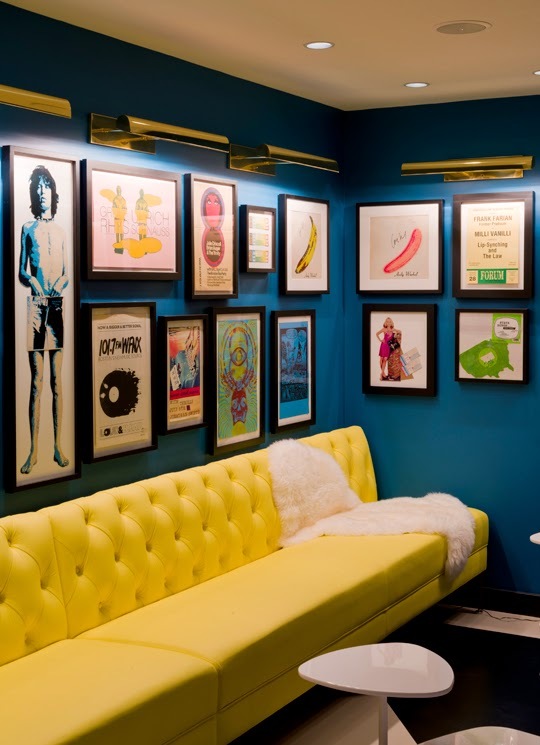 We wanted to buck the baseball trend and turn this iconic 'rock n roll’ past into a unique, irreverent, and altogether alternative hotel experience. 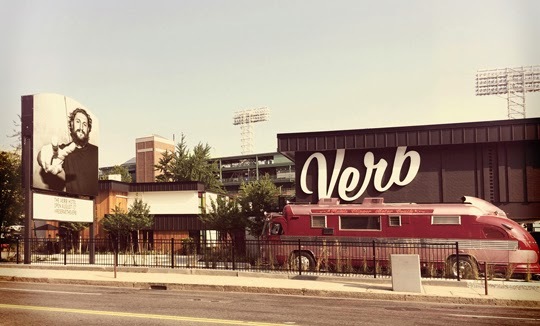 Our ambition: To return the site to its rightful place as the home of Fenway’s legends and good times while injecting it with all the things our modern guests could want. 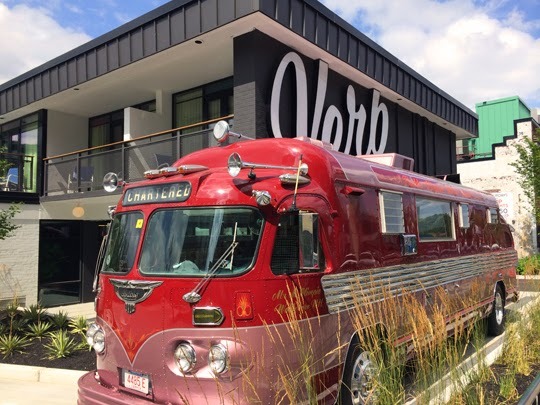 Enter The Verb Hotel. 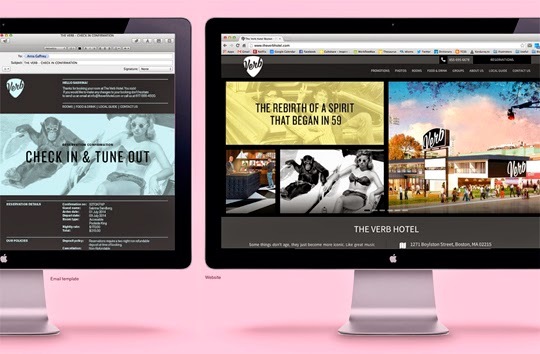 From a branding perspective, the hotel delivers in two areas. The visual look which is authentic, the original architecture restored, idiosyncratic touches and colourful references placed throughout. 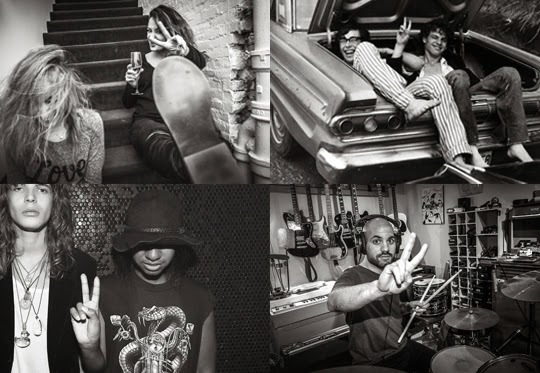 But there's also a story that's told through every touchpoint - references to music, an irreverent, counter culture spirit that reconnects The Verb with its original cultural roots while creating an entirely new local experience. 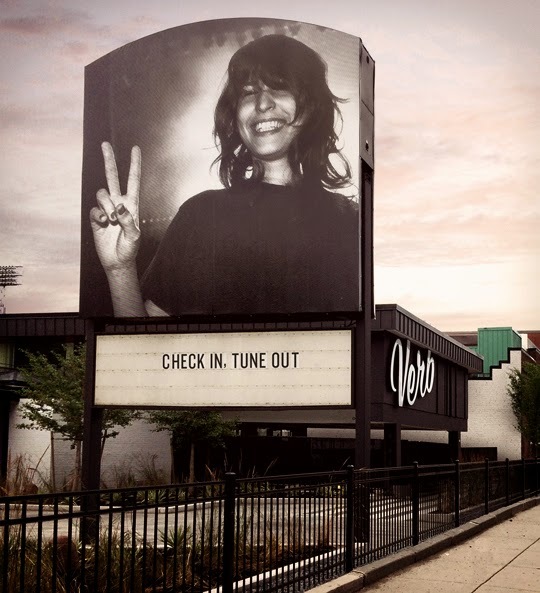 A big part of the visual language for the hotel centres around local characters giving a 'V sign' or 'Verb sign' as we like to call it now, which we acquired by sending a local photographer round the streets of Fenway. 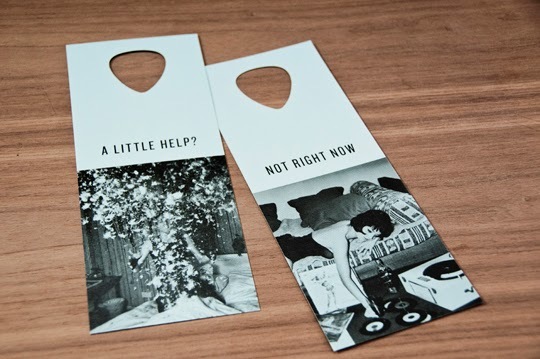 The concept immediately took of and formed part of the hotel's social media strategy. 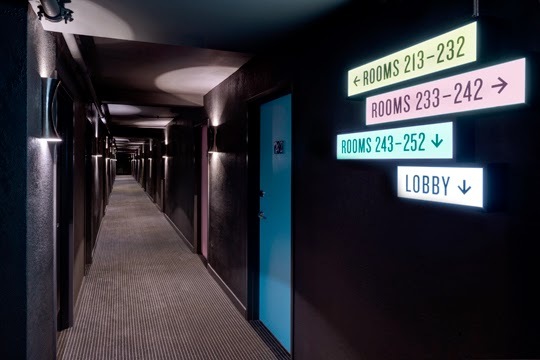 A curated 'exhibition' of rock n roll artefacts, images and collectibles, courtesy of The Boston Phoenix, also appears throughout the hotel, stacked light boxes (referencing old 50’s gig venues) are reimagined as the hotel’s signage, while large typographic murals such as “Walk This Way” (Aerosmith) have been painted in stairwells. 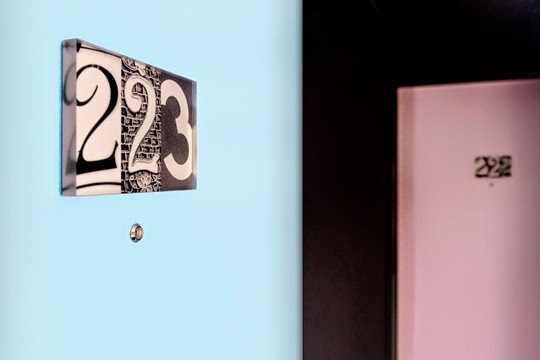 Rooms are made to feel individual with the addition of irreverent quotes and touches - each room has its own reconditioned 60’s typewriter, murals of screaming fans and paparazzi adorn bathrooms and in-room directories that take inspirations from lo-fi music zines and festival programs. Oh, and why the name? 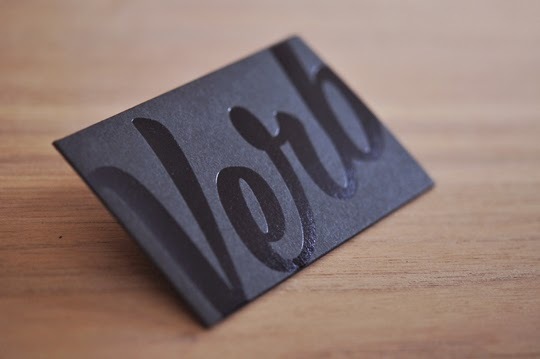 Well, if you want to get literary about it, “Verb” describes an action, and a state of being. 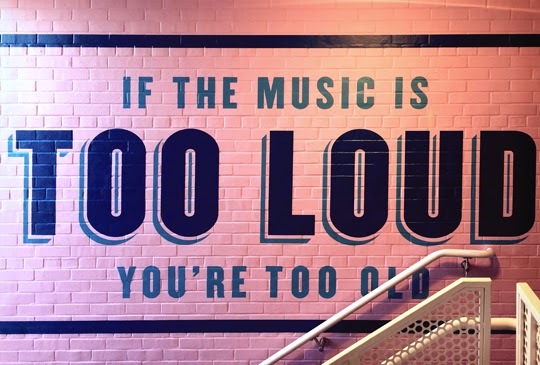 But we like that it came from “reverb”—a reminder of the music and attitude that is live and kicking in Fenway. 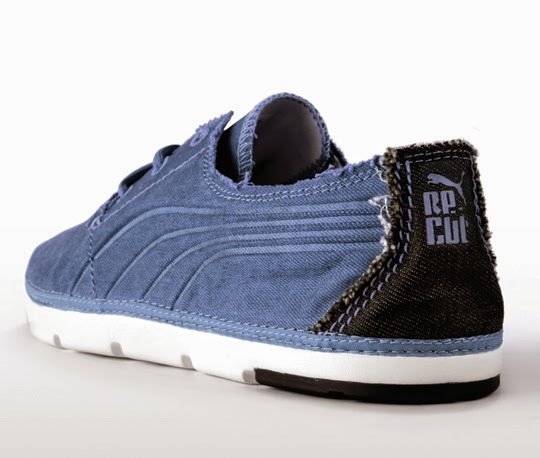 PUMA have teamed up with the Saitex denim factory in Vietnam to launch a new collection of sustainably made shoes. They have been re-cut from denim off-cuts that would normally have gone to waste. Denim manufacturing processes are usually very wasteful, however the Saitex factory is setting a new benchmark in the industry. Not only is the factory recycling their unused denim, it is also using solar power and rain water capture to keep wasted energy down to a minimum. 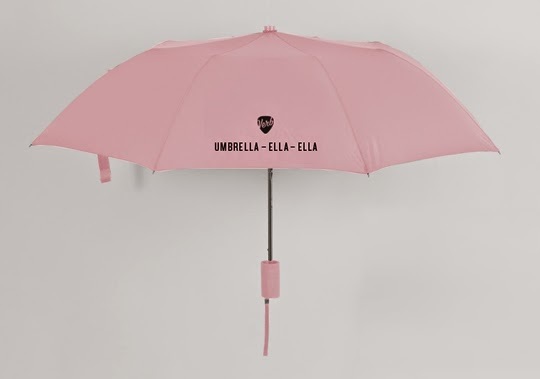 On top of all of that, PUMA are donating the profits from this collection to the Be Tho Orphanage situated near the PUMA and Saitex factories. The orphanage is home to approximately 136 children from new borns up to 16 years old. The profits will be used to provide education, meals and medical care for the children. We were asked to create a name and logo for the shoes, as well as concepts for how the branding should be applied to the shoe. We wanted our logo to look recycled as well as demonstrating the big idea of one thing being re-cut into something new without there being any waste. Prior to the launch were given a collection of video clips of the orphanage, denim factory and Puma factory, and asked to tell the story of how these shoes are 'cutting waste and doing good'. We intentionally cut all the clips together in a lo-fi, slightly old school way. We also added in some recycled clips from other films to add to the recycled story and build on the slightly rough, imperfect aesthetic. 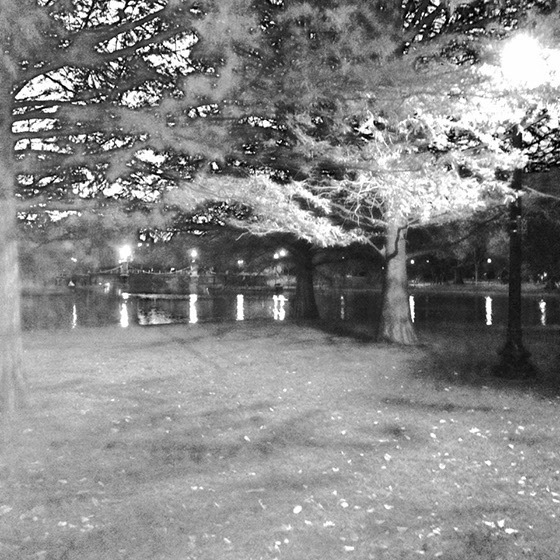 Even the soundtrack took samples from the supplied footage creating and eclectic and unique backing track. 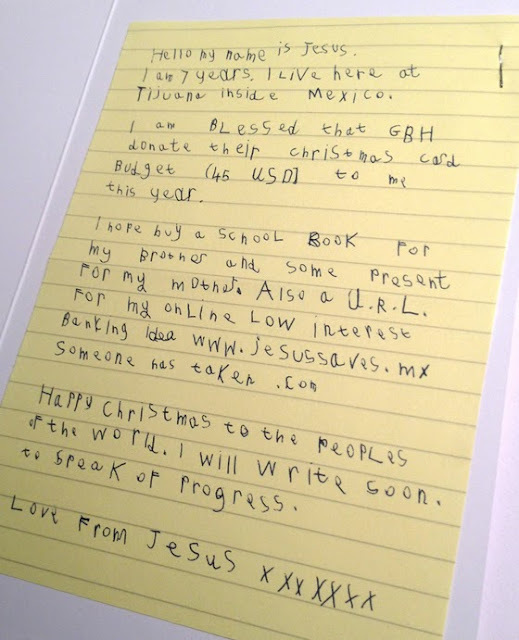 This holiday at GBH saw the latest resurrection of ‘Jesus’, a young Mexican boy turned entrepreneur who has been writing to our friends and clients at Christmas for the past three years in thanks for GBH’s transformational donation of their annual Christmas card budget to charity. In a surprising twist, its here that the reader can learn about and help various charities that work towards finding missing children, just as GBH have done with this year’s christmas card budget. ‘Jesus’ has come a long way since his first mail-out. 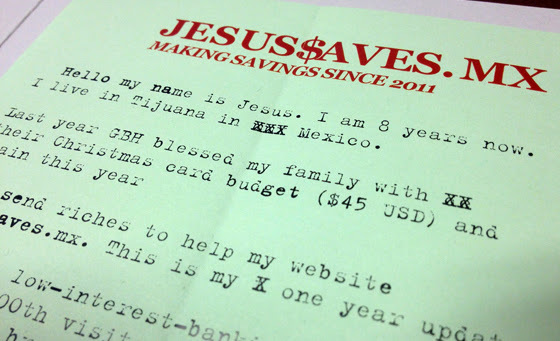 Back in 2011 the impoverished 7 year old from Tijuana told us of all the things that he hoped to achieved with GBH’s princely $45 Christmas Card budget donation… most importantly buying the www.jesussaves.mx domain name to pursue his online low interest banking idea. A year later he updated us all again telling us of the great successes he was having with that online business, donning a dapper pinstripe suit. 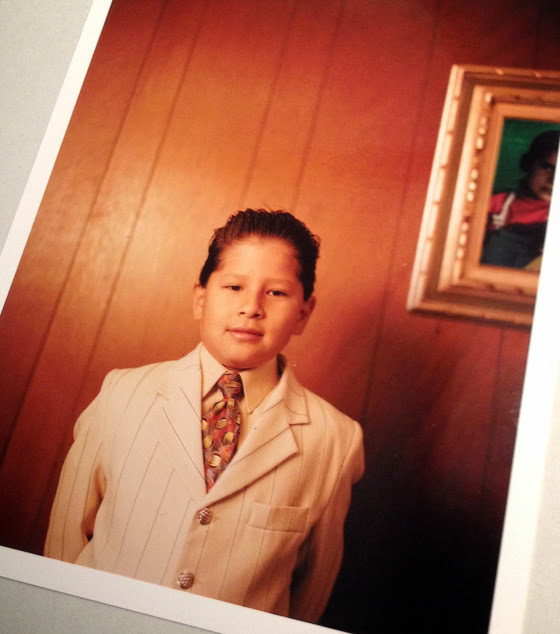 At just age 8 he could afford to buy his mother a Suzuki Liana Cabrolet with only 52,000 miles. All thanks to GBH. Sadly, his rags to riches journey has hit a new challenge in 2013, with a stint in Jail. 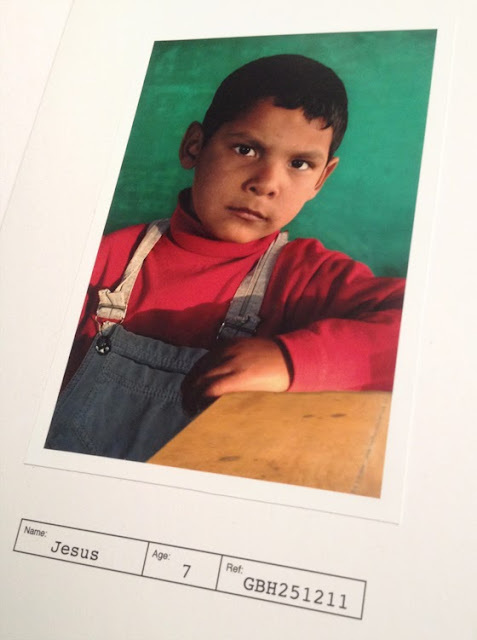 In true ‘Jesus’ fashion, adversity becomes opportunity and from here he has launched the ‘Foundacion de Jesus’ in order to find and help more ‘Jesus’ like him. 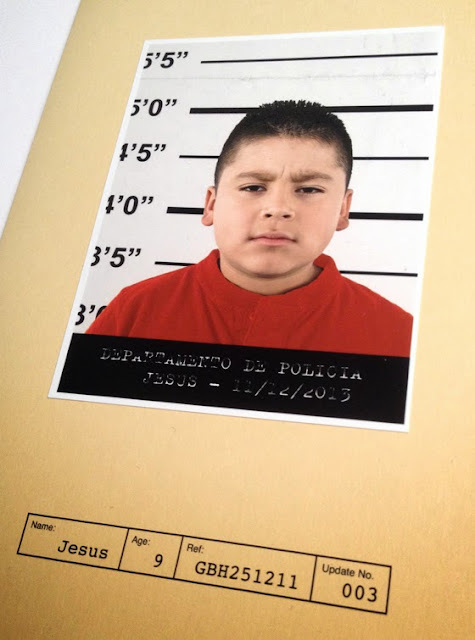 Of course the story of ‘Jesus’ according to GBH is entirely fictional, but behind the humour is a very real message about children and charity, young people who live in poverty or are separated from their families at Christmas, not just in Mexico but all over the world. Our hope with this trilogy of Christmas messages is not only to flip the pre-conception of what a Christmas card can be, but also to re-think how a charitable cause can be bought to people’s attention in an unexpected way. Our aim is to provoke the recipient toward thinking about issues of religion and charity in an entirely new light. 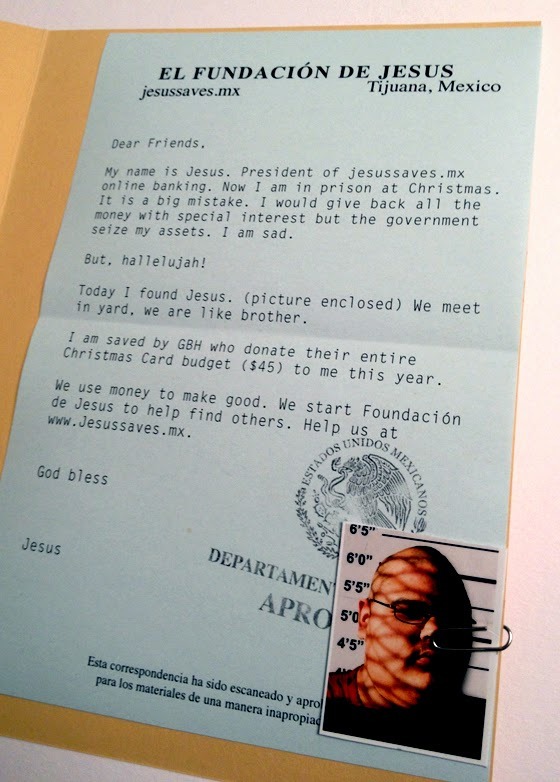 As a result, GBH have sent more than 800 cards from ‘Jesus’ since 2011 and have donated around a £1000 to charities including www.actionaid.org.uk, www.missingpeople.org.uk, www.findmadeleine.com, www.soschildrensvillages.org.uk, www.newlifemexico.com and www.lovelifehope.com. 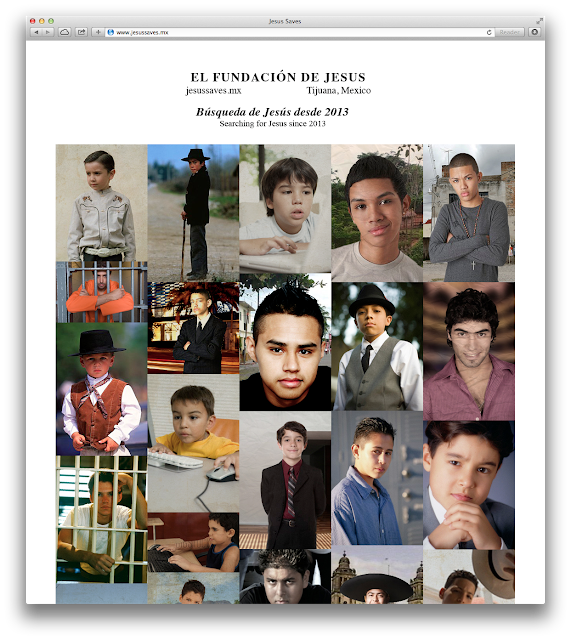 Help us to raise even more to help young lives at Christmas by donating via the ‘El Fundaciòn de Jesus’ here at www.jesussaves.mx. 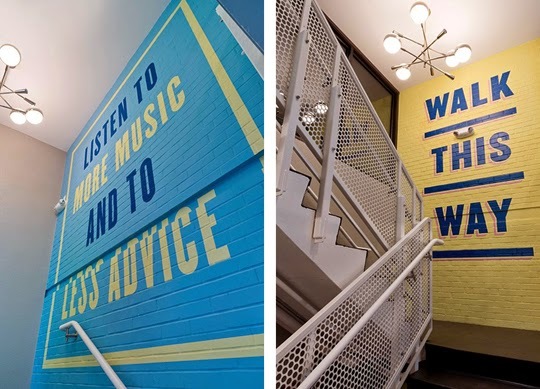 GBH has created a Pop-Up Studio in the Fenway area of Boston, Massachusetts. We’ll be resident in town for 6 weeks in order to kick off an exciting new Hotel Project in this part of the city with our new clients, Samuels & Associates. All three project relationships in one place made setting up shop in this great city a no-brainer. 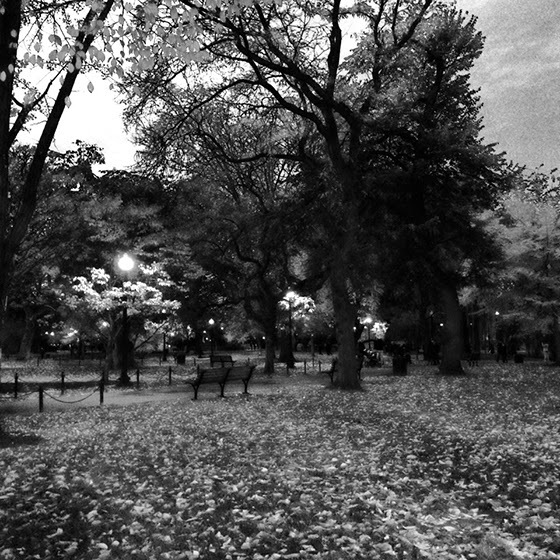 Luckily for us, its the Fall out here, so our timing is absolutely perfect as its a miraculous sight. Fire literally hangs from the trees and its different everyday. We’ll keep you posted with more from Boston as the next 6 weeks progress. If you’re in the creative industry and near to Boston or in the city, we’d love to meet you. If your agency or university would like GBH to visit and perhaps give a mini-talk from our portfolio of work whilst we’re here, please do get in touch. Drop us a line at mark@gregorybonnerhale.com as we’d love to say hi while we’re here. 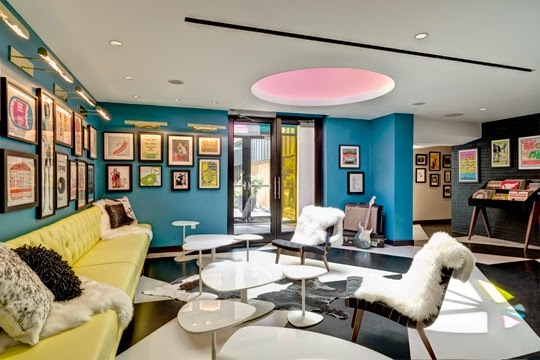 Our friends at Mama Shelter have already revolutionised the concept of the luxury hotel with their unique mix of style, eclecticism and affordability. Now they've worked their magic on the bath-time experience with Mama Skin, the first in a range of fabulous in-room bathroom products named and designed by GBH. The organic product, co-created by Absolution, the premium natural beauty brand, is an all-in-one body wash, shampoo and conditioner, made of the finest natural ingredients. Not only does it feel amazing on your skin, but being an all-in-one lotion means you don't need the usual clutter of unlovable bottles in your hotel bathroom. As creators of the Mama brand identity, we knew that the design should be super-stylish while reflecting the premium quality of the product. 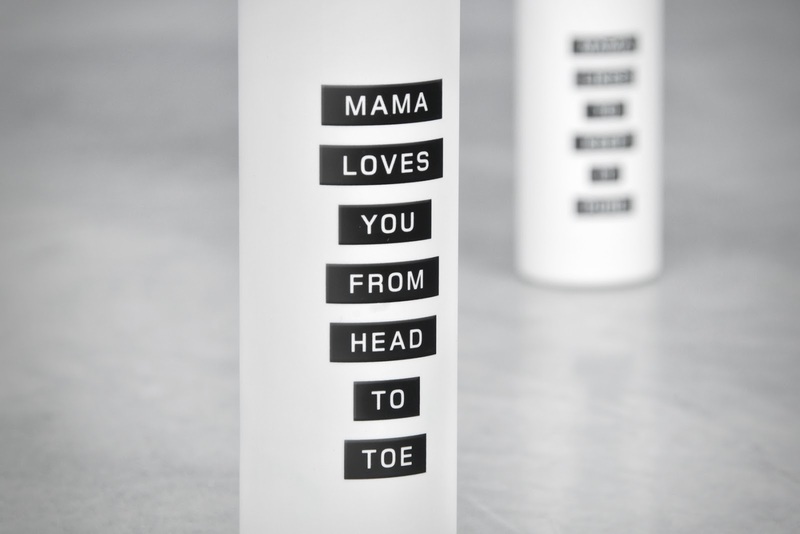 The start point was to work with Absolution and Mama to select the perfect 100ml bottle - an all-white cylinder with a velvety touch. Simple and elegant. From there we concocted a series of Mama sayings that that cheekily communicate the organic quality and multi-use of the contents, with phrases like 'Mama loves you from top to bottom' (multiple messages also mean that regular guests are treated to a different message every time they check-in and that the bottles become highly collectible!). 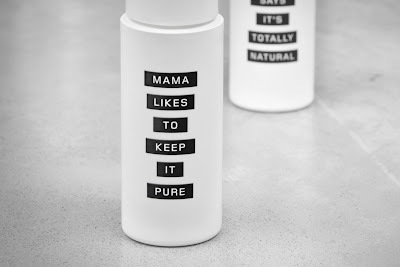 Meanwhile the graphics take the form of boldly striking labels, printed in gloss black to lift off the matte white background, while all other details are 'hidden' on the reverse, making the bottle as simple and desirable as possible. 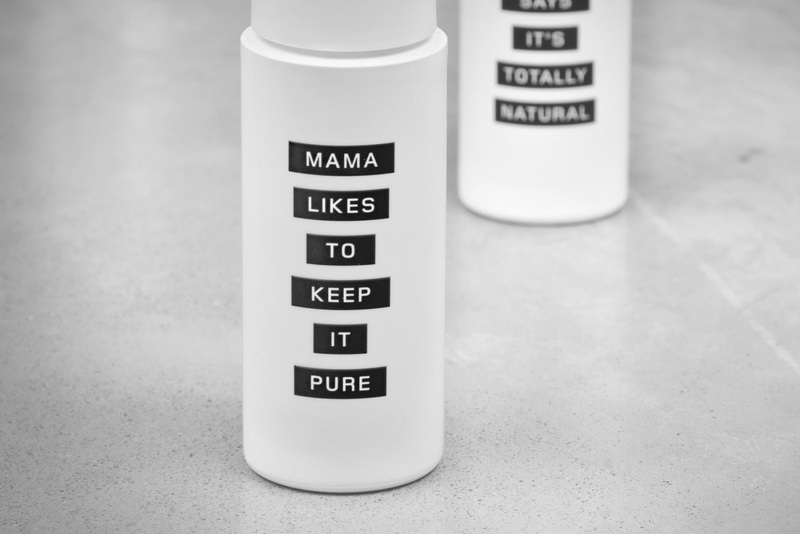 In addition to the complimentary 100ml bottles, 200ml versions are now available to buy at the Mama store and even come in a tasty little bespoke bag. But the best thing is that the product range is set to expand, with new scents and ingredients launching over the next year. 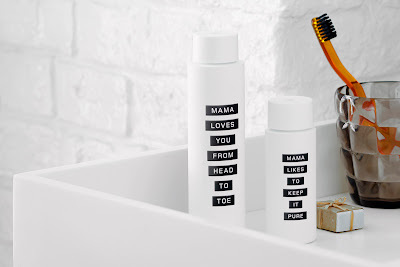 So if you're passing through Paris, Lyon, Bordeaux, Marseille, Istanbul or LA, why not drop in and let Mama treat you to a good scrubbing down. Say Hello to Joy. Again. You may remember that back in 2011 we launched a range of permanent digital installations and initiatives in PUMA's global stores. 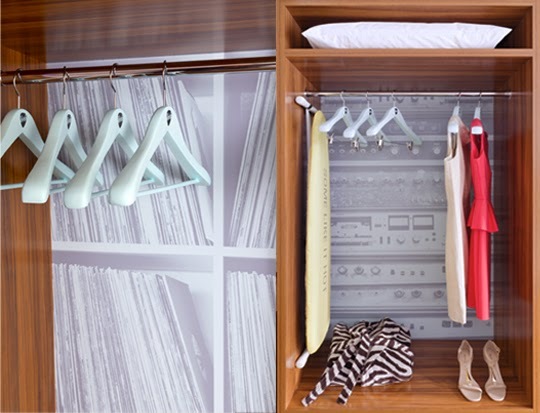 The initiatives, a curious cabinet in changing rooms, a public phone that talks back, a large games wall and a range of ambient films playing on the ceiling, were all designed to bring moments of joy and surprise to our customers' experience. After the success of these initiatives, we're now pleased to show you our latest wave of content for the installations which have already begun rolling out to some of PUMA's 250 locations worldwide. All of the video content content was shot or generated from scratch working with our production friends over at Art & Graft while digital wizardry and animation was again made possible thanks to Dotglu in New York. Check out the film or experience them for real at your local PUMA store. As Borussia Dortmund will testify after their thrashing of Real Madrid recently, our typeface for all Puma National and International Football Kits brings success after success. The latest being a One Show Silver Award from New York’s finest Design and Advertising Show (well, one of the finest anyway). The typeface was created by us in collaboration with our good friends at Dalton Maag, and has been Puma’s on Kit font for player names and numerals since the African Cup Of Nations in 2011 and will take the brand’s teams up to the FIFA World Cup in Rio, where a new font will be unveiled the fourth in GBH’s long relationship with the brand. Here’s a short film we put together in-house to shed some light on the font’s origins, as it effortlessly emphasises Puma’s through-the-line international advertising campaign MAKE FOOTBALL ANYWHERE, with its raw, Gaffer tape inspired, instantaneous energy. The project was led by Creative Director Mark Bonner, with Designer Jacob Vanderkar. Designers Will Kinchin and Jacob Vanderkar can be seen starring in the film above... with Will’s incredible hand-made soundtrack the pièce de résistance. Ever since I was a kid, I’ve loved these as a graphic example of joyful loveliness. This shiny graphic wonder – wrapped flag-like around its famously independent chocolate marshmallow – has held us all spellbound since childhood with its radiating powers. We proudly smooth out the wrinkles after every one we eat, ’til it gleams in all its glory. Forever flattened these special varities have been silkscreen printed onto ultra-thin 1mm Stainless Steel and Solid Brass, so they’ll never ever crease. 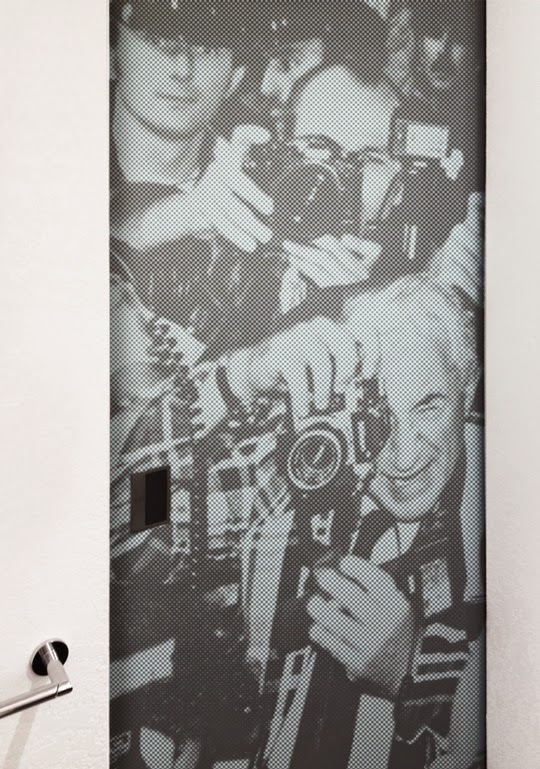 A Limited Edition of 48 Silkscreen Prints onto Stainless Steel or Solid Brass. 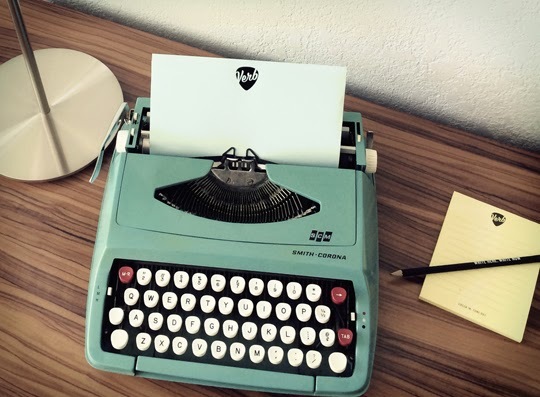 How do you tell the story of an iconic British television series that features a character who has been travelling through time on our screens for the last 50 years? One who has regenerated into eleven different bodies, has discovered the deepest secrets of the universe, and has met numerous mind-boggling characters along the way? 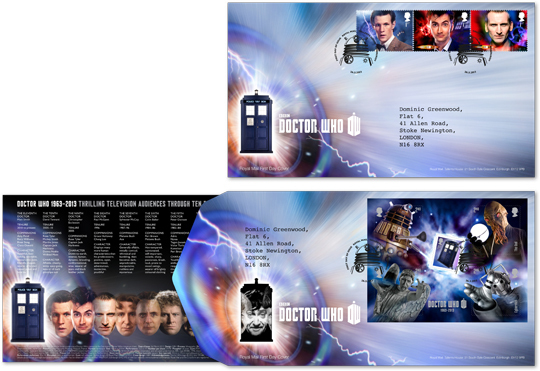 This was our challenge when we set out to create the presentation products that coexist alongside our Doctor Who Special Stamps and Mini Sheet to celebrate the 50th anniversary of Doctor Who, the longest running science fiction series in television history. 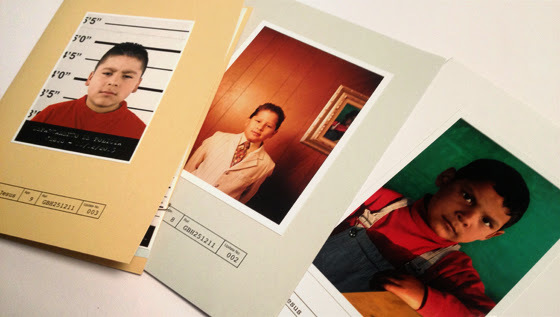 The passing of time was a key theme in creating the visual language that enabled us to unify the numerous unique products, while clearly communicating the show's constant evolution and the associated characters within it. From William Hartnell in 1963, to the current Doctor, Matt Smith there was a vast amount of content to squeeze in. 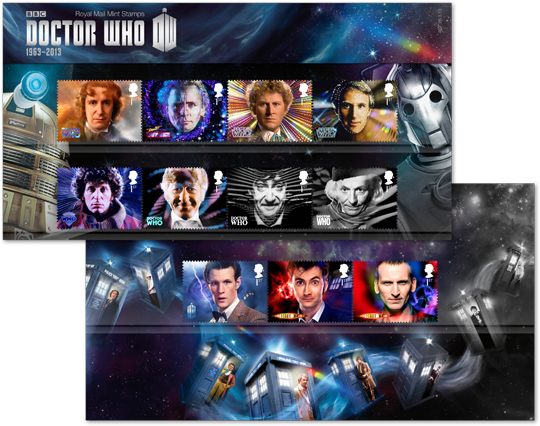 A special Presentation Pack containing all eleven First Class Doctor Who stamps, as well as the exclusive Mini Sheet stamp set, unfolds to reveal a vortex of time spanning decades of the Doctor's adventures as well as his trusty Time Machine, the TARDIS itself. 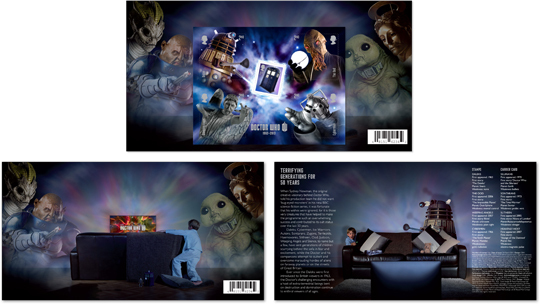 The accompanying Mini Sheet Carrier Card plays on that classic 'hiding behind the sofa' moment that all Doctor Who fans young and old will know only too well. 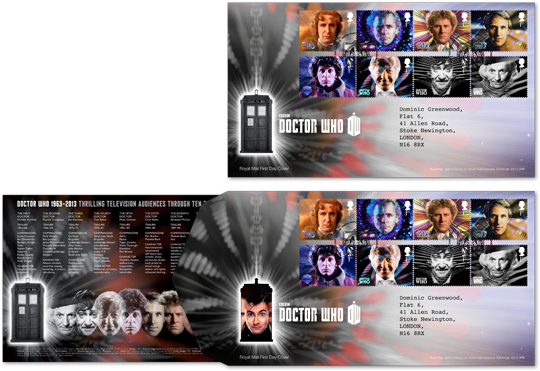 First Day Envelopes – in both classic and modern era varieties – feature a die cut TARDIS silhouette that reveals the regeneration of the Eleven Doctors as you pull out the information cards within them. 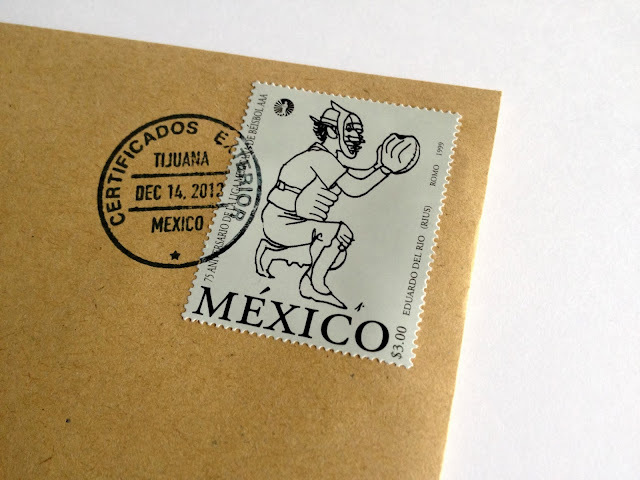 Specially designed hand stamps that detail two of the programme's most iconic villains, a Dalek and a Cyberman, are exclusive to the First Day Envelopes. 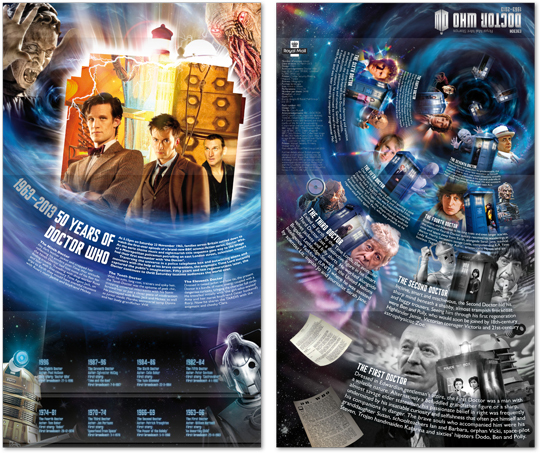 A 26 page Prestige Stamp Book was commissioned to mark the 50th Anniversary, featuring dual covers that allow the reader to travel both forwards in time through the show's history, or backwards in time to the show's origins. 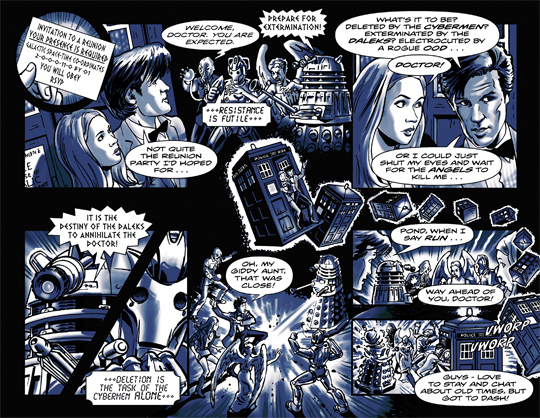 The TARDIS itself punches through each page of the book from cover to cover, revealing the regenerating Doctor within, and charting the decades of his captivating adventures. 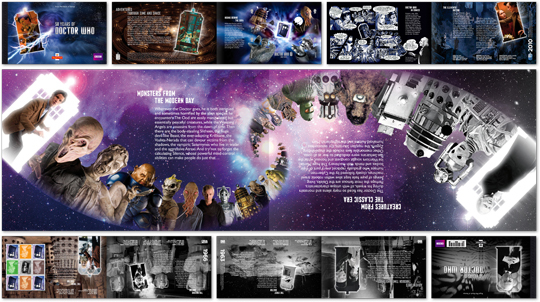 The striking central spread features 50 years of the show's most iconic villains that flip the book through 180 degrees to continue the story from front to back, and vice versa. 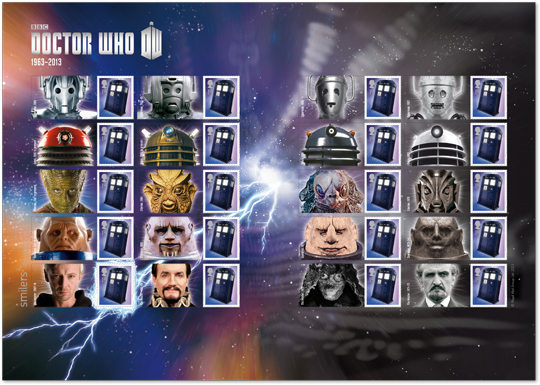 Continuing the theme of classic enemies, the First Class Definitive Stamp Sheet highlights five of the show's most popular villains who have survived the test of time, evolving as they have from classic era Doctor Who, all the way through to the present day series that we still enjoy today. 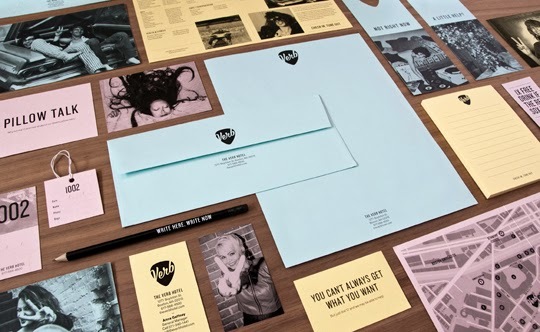 The project was led by GBH co-Creative Director Mark Bonner, with designers Harry Edmonds and Dave Wood completing the team. 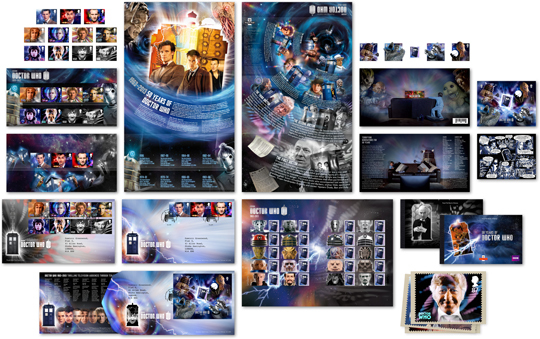 The full set of Doctor Who 50th Anniversary products are available now from the Royal Mail website. GBH would like to thank Dean Price and Helen Cumberbatch at Royal Mail for their support and encouragement. How do you rebrand something that nobody wants? 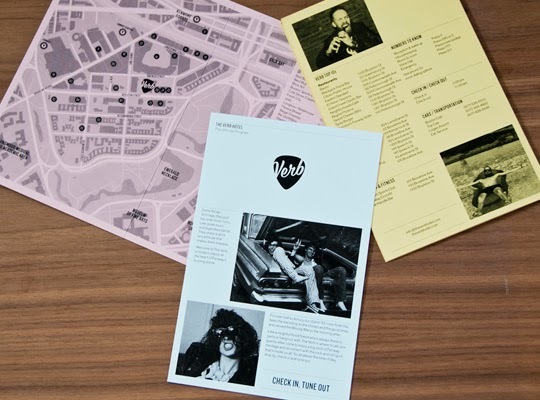 Now with a team of 16 people, GBH are a multi-award winning design and advertising agency based in London. 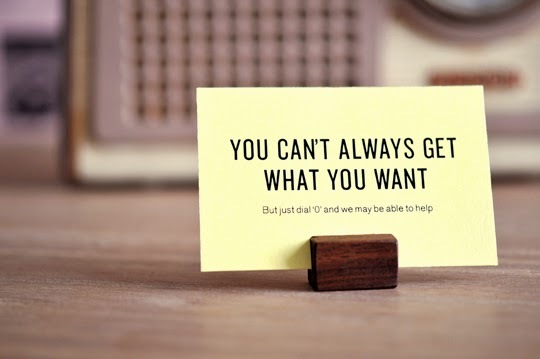 GBH solve communication problems for a diverse mix of clients in Identity, Print, Packaging, Digital, Retail, Environment, Advertising and Online. GBH has consistently been ranked within the ten most creative UK Design agencies since the company’s foundation in 1999, reaching No. 2 in 2008 and again in 2012, currently sitting at No.3 in 2013. (Source: Design Week Creative Survey). in the 2013 The Design Week Creative Survey, an annual ranking of design consultancies across all sectors based on their number of award wins. © GBH Design Limited. All Rights Reserved.